Low Carb Luxury Weekly Recipe Newsletter! The issue of sugar alcohols is sometimes not a very clear-cut one. Some people handle them better than others. Some are more sensitive to their "laxative effects", and others are more sensitive to them metabolically. But one particular polyol really stands out as an exceptional sugar substitute. It's called Erythritol, and unlike most other sugar alcohols, it is well tolerated and does not produce gastro-intestinal problems. You can mix erythritol with high intensity sweeteners (sucralose, etc.) It seems that only TINY amounts of sucralose, aspartame, or acesulfame-K are necessary to boost the sweetness intensity of erythritol by about 30%! And it cooks and behaves like regular table sugar, allowing you to make candies, and more. Yes, it will caramelize, too. All of this means that Erythritol represents a very significant advance in the polyol sweetener sector. 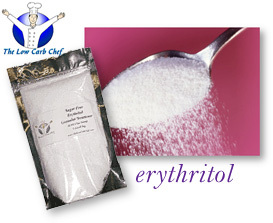 Erythritol is a natural constituent of a wide variety of foods such as grapes, melons, pears and fermented foods and can also be found in the tissues and body fluids of humans and animals. A relative newcomer to the United States, erythritol has been sold in Japan since 1989 and used primarily in beverages, but also in candies, chocolates, chewing gum, yogurt, fillings and coatings in cookies, jellies, jams and as a sugar substitute. The FDA granted GRAS status to erythritol in 1997, and approvals are currently pending in Canada and Australia. For those of you (techies) who care about such things, Erythritol is a linear four-carbon sugar alcohol, polyhydric alcohol or polyol. Erythritol has an excellent safety profile and good digestive tolerance, even at the highest anticipated use levels. And its molecular formula is: C4 H10 O4. We can't imagine not having it in our kitchens! It comes in 16-oz. containers (both in regular granulated, and in super fine) from The Low Carb Chef, and you can purchase it online from The Low Carb Dieter's Page. Yet another new sweetener hits the scene with the introduction of Carbolite's Splenda-Based Granulated Sugar Substitute. With a sugar-like consistency (pourable granules rather than the fluffy stuff), it's built on a fiber foundation; not a carby filler like maltodextrin. The Carbolite uses a mix of guar gum and inulin with the sucralose. Most folks know about guar gum (derived from the ground endosperm of the guar plant making it a fiber with thickening powers), but many might not have heard of inulin. Here's the run-down: Inulin is a naturally occurring fiber. It is present in common fruits and vegetables such as artichokes, asparagus, onions, and garlic. Most commercial inulin is now a product of chicory roots and uses a natural hot water extraction process. So what does all this mean to you, the low-carb dieter? It means that you have yet another sweetening 'tool' in your kitchens for times when you need to cook with Splenda, but don't want the added carbs of traditional pourable Splenda (that has a maltodextrin filler), and can't use a liquid in your particular recipe or dish. It's also 4 times more concentrated than Splenda (which keeps itself measure for measure with real sugar.) So you can use less, making it pretty economical. The drawback is, that because it's fiber-based, it doesn't disolve well in cold/cool temperatures, so don't try pouring it into your iced tea. But in hot coffee or hot tea, or when cooking, it's a gem. Remember, though, it has a slight thickening power because of the guar gum. This can be a help in some recipes and a problem in others, so use your good judgement. For instance, adding it to a homemade pudding, custard, or syrup is a good idea. Adding it to an almond flour poundcake can make it too thick and dry. So use it as appropriate and enjoy this new option. 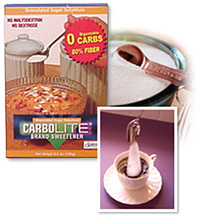 Carbolite Sweetener is available online at The Low Carb Connoisseur, and The Low Carb Nexus. UPDATE November 2001: This product is no longer available. The best thing about liquid sweeteners is that they are truly zero-carb, zero-calorie. The drawback up until now, is that in America, our only choice for a liquid sweetener has been saccharin (and in Canada — cyclamate.) 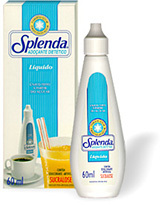 How long have we all waited for a liquid version of sucralose (Splenda)? Well, the wait is over. Thanks to Synergy Diet importing it from Brazil, we can now have a splash of sweetener in almost anything without adding the carbs we get with the fillers in granulated and packet versions. It's quite concentrated so the 60 ml bottle lasts a good amount of time. Aside from the obvious uses, we discovered it also works very well in cooking. For example, in french toast recipes (of course made with low-carb bread!) we added a few drops to the egg/cream dipping mixture (with some cinnamon of course.) It made the french toast very restaurant style without making the mixture gloppy like granulated Splenda can do. It also performed well in flans and custards. And here's another use: Did you ever get a sparkling water that was bitter (or a fruit one that needed a little sweetening?) The first time I did was in a little retro theatre with my husband. It was the only "diet" drink they sold at concessions. So I'm thinking, "Well, I have a few Splenda packets in my purse..." I added one to the open can and it nearly exploded all over the theatre. How embarassing. (Okay, I was a newbie then.) However, the liquid version can be squirted into carbonated beverages to add sweetness. Yes, we wish they'd release a liquid version here in the U.S. to sit right on the shelves with the other newly packaged and distributed Splenda. But until then, we're fortunate to be able to order it online from Synergy Diet. This is another product we recommend in small doses. Steel's Vanilla Nature Sweet is made of maltitol - a pure sugar alcohol (plus vanilla extract). It has a carb count of 12 grams per tablespoon on the label (though sugar alcohols have little effect on insulin/blood sugar levels and many low-carb chocolate candies deduct the maltitol from the carb count.) My practice is to count them at 1/4 the listed carb count and so far, it's kept me in ketosis and has not been a problem. However, we are not recommending this for pouring over your low carb pancakes and breads. The carbs (and unpleasant effects of sugar alcohols) can add up real quick that way. But like some of the other sweeteners on this page, it's a great option for a baking and cooking ingredient. Here's why — it's not only very concentrated (so a little goes a long way), but it's very thick ! That means that when mixed with a zero-carb syrup you can approximate Karo-like corn syrup in your cooking. We put it to the ultimate test with our Southern Pecan Pie recipe. When mixed with Butterscotch syrup (see our review for Nature's Flavors syrups) and maple syrup (both zero-carb), we got a fabulous filling for our pie. We used 2 Tablespoons in the recipe making it an addition of either 6 grams to the recipe (using my 1/4-carbs counting method) or 24 grams (using the full-label method) making the pie either 5 or 7 1/2 grams per slice. It's versatile enough to use this trick wherever you used to use Karo Syrup. I find this at my local grocery store in the sugar-free area, but if you can't find it, it can be ordered online at The Low Carb Connoisseur and BakingShop.com. When you are working with many of the "old favorites" dessert recipes trying to convert them, there are times when the items call for powdered sugar. I have so often seen the question posed, "How do we make powdered 'sugar' out of Splenda or some other sweetener we can have?" And the answer is that you really can't. But here's a product that's very useful to keep onhand for those times when a dab of powdered sugar dusting is required. It's from Steel's Nature Sweet and you won't be able to tell it from real powdered sugar. The catch? Well, it's not carb-free and has a maltitol (sugar alcohol) base, so it comes in at 2 carb grams per serving, but I have to say that for a light dusting on a dessert cake, or to roll peanut butter cheese balls in (recipe posted soon), that ain't bad at all. We made a gorgeous chocolate almond-flour cake and when cool, we placed a paper doily (any cut-out would do) on it and sprinkled the Steel's Powdered Nature Sweet on top. When we removed the doily, the cake was photo-gorgeous. And it added less than a carb to each serving, so we plan to keep this around for awhile! By the way, a 2 lb bag will cost you around $12, but will last you a very long time indeed. Steel's also makes a Brown Sugar clone. Same carb count and also excellent for baking, but for most uses, the Brown Sugar Twin can be used to save carbs. We found these products in a number of health food and specialty diet areas of groceries, but if you can't locate them, can be ordered online at The Low Carb Connoisseur. Here's another sweetener choice that I recommend you keep on hand if you bake. It's called DiabetiSweet and it's made by Health Care Products Company. Now first, let me tell you that we are not recommending you use this as your sweetener of choice in your low-carb eating plan. The reason? It is a mix of Isomalt (a modified sugar alcohol) and ace-k. So the disadvantage is that it's not carb free. It has 1/4 the carbs of sugar and very little if any effect on insulin levels. So for small specialized uses, it can be invaluable. Here's why — it offers sugar-like capabilities for baking, browning and syrup making that you simply cannot get with Splenda, or any of the zero-carb sweeteners. But remember, because it does contain carbs and because sugar alcohols in quantity can cause unpleasant effects (see our page on sugar alcohols), use it only where real sugar creates a necessary effect. For example — if you want to make creme brulee, you'll need to have a browned sugar-crisped top. You can use Splenda (which works great) to make the custard center, but for the top, artificial sweeteners won't work. Mix a bit of Brown Sugar Twin with DiabetiSweet's Isomalt, and you get a great browned top without sugar's terrible blood sugar effects. In ice cream, sugar keeps it from freezing like a block, but "our" sweeteners won't. The answer? Use a couple of tablespoons of DiabetiSweet in the mix and you'll see a big improvement for an addition of less than 3 carbs to the recipe. DiabetiSweet measures like sugar and is Aspartame Free and contains no Sucrose, Fructose, Dextrose, Maltodextrin, Sodium, or Saccharin. It's a tasty and useful item to have on hand for small uses, and for that, we recommend it. If you don't cook and bake, don't order it... Stick to Splenda et al for regular sweetening. 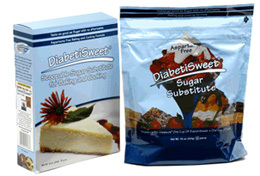 You can order DiabetiSweet online at Diabetic.com. Use it in low-carb baking and as a table-top sweetener. Is there a downside? Yes. It's not made with sucralose. It was originally slated to be made with sucralose as its only sweetener, but legal restrictions in its use as a tabletop format prevented this. It's based primarily on ace-k as its sweetener. So the honest fact is, tasting it straight is not terrific, but adding it to foods and beverages proves to be a winner! In shakes, sprinkled over low-carb cereals, and in baking, it's super and I highly recommend it. products are available from Low Carb Connoisseur, The Low Carb Dieter's Page, and Life Services.